Rugby & Northampton performed well in a packed English Cross Country Association National Relays at Berry Hill Park in Mansfield. The ECCA National Relays sees many of the country’s elite long-distance runners battle it out for top spot with more than a thousand teams entering across the 10 age group races. Leading the way for R&N was the under-13 Boys Team A which crossed the line in 11th. Louis Buttrick was fastest in the team, finishing the six-kilometre track in seven minutes and 14.55 seconds. Also running were Aiden O’Brien (7:30.85) and Noah Bennett (7:20.55). The U13 Boys Team B finished in 54th thanks to Michael Corbett (7:48.50), Benjamin Carroll (8:06.15) and Finlay Heard (8:19.20). Peter Van Uem (8:37.30) was the fastest member of Team C while Ryan Baker (8:43.25) and Lawrence Saunders (8:42.80) helped seal 69th place. The U13 Girls highest finish was a fine 30th place for Team A which comprised Elspeth Unitt (8:25.0), Olivia Williams (8:18.40) and Claudia Searle (8:11.10). Seventeen positions back, in 47th, were the U13 Girls Team B with strong runs from Zoe Gardner (8:17.15), Sophia Hill (8:33.30) and Mia Clark (8:48.30). The U13 Girls race also included a 64th-place Team C thanks to Abigail Thayanithy (8:42.75), Meghan Lawes (9:00.05) and Alice Bates (9:07.30). Adam Caulfield (6:34.05) was the fastest R&N U15 Boy on the course, and he was supported by Ben Hope (6:47.45) and Cian Hutton (7:19.15) as Team A finished 15th. The U15 Boys Team B were 55th, while Team C were 22 places back in 77th. Dominic Dewes (7:56.25), Luke McTurk (7:32.40) and Myles Martin (7:15.10) were all members of Team B, while Team C consisted of Matthew Blomley (7:20.75), Joe Baker (8:48.30) and Tom Allee (9:11.15). The Athletics Club was led in the U15 Girls race by Abi Pearce (7:59.70), who was joined in Team A by Holly Walker (8:06.50) and Neve Satchwell (8:27.70) as the side finished 51st. Rebecca Edwards (8:15.35), India Phipps (8:51.65) and Isabelle Ripon (8:40.15) lifted the U15 Team B into 72nd place, while Team C completed the race in 85th thanks to Amelia Dickens (9:00.65), Emma Barker (9:21.25) and Millie Pashler (9:23.25). R&N’s sole team in the U17 Women’s race was made up of Hollie Moore (10:28.40), Olivia Sheehan (10:55.65) and Charis Hayes (11:12.00), who performed well over the seven-and-a-half kilometres for 56th. Matthew Chronicle (9:54.95) led the U17 Men Team A into 30th place across the nine-kilometre course, and he was joined by Rhys James (10:00.50) and Joe Musgrove (10:00.75). Team B crossed the line in 63rd thanks to runs from James Wizard (10:29.80), Will McMurtrie (11:21.25) and Finn Hutton (10:14.00), while Josh Thorman (10:50.70) and Adam Bebbington (11:38.55) combined in the U17 Men Team C.
The club’s Junior Men’s involvement over the nine kilometres was led by a 21st-place finish for Team A – Adam Wright (9:12.10), Ben Musgrove (9:31.10) and Jack Bond (9:23.75) – while the Junior Women’s team which included Emma Bond (9:18:15), Rebecca Leadbeater (9:55.70) and Kirsty Goddard (10:51.05) finished 22nd in their respective seven-and-a-half kilometre competition. Also on the track were the Junior Men’s Team B and Team C, who finished just three places apart. Team B clinched 52nd spot with Hayden Arnall (9:55.05) going below the 10-minute mark, and he was joined by Edward Wise (10:42.40) and Joe Childs (10:44.90). Meanwhile, in 55th place, Oliver Munns (10:35.75), Carl Robertson (12:19.65) and Alex Solano (11:44.65) were all members of Team C.
The Senior Women’s Team A completed the competition in 49th with performances from Tamara Hardman (12:06.0), Melanie Wood (11:07.90) and Zoe Shepherd (12:51.55). Team B, in 75th, was made up of Tilly Lea (14:02.70), Jo Pulsford (11:48.05) and Minerva Chesser (14:28.55). It was also a magnificent weekend in Yorkshire for Elisha De Mello as he competed in the Age UK Leeds Abbey Dash 10k Road Race. De Mello completed the race, which was also the England 10k Championship, in 37th amongst the 8,000 runners, with a personal-best time of 31:12. Elisha was joined in the race by Ben Musgrove who also set a personal best time, 34:35, on his way to finishing 170th. NORTHAMPTON teenager Emily Williams has won the Young Sportswoman of the Year at the 2016 Kettering Sports Awards. 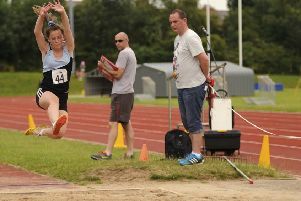 The Northampton School for Girls pupil, who runs for Kettering Harriers AC, has enjoyed a brilliant year. Williams was delighted to finally win the category award after twice missing out in previous years. Her coach Shane Smith praised Williams, and her attitude to training: “She is ever present at all the sessions I set her, no matter what the weather, she trains like a demon. In 2016, Williams won her first National title, the English Schools Cross Country Champion, and also realised one of her dreams in representing England in a cross country international fixture in Falkirk where she won a team gold for her country. Williams also enjoyed a successful track season, winning a silver medal at 800m at English Schools T&F Championships, and being ranked second and third in the whole of the UK at 1500m and 800m respectively.